The technologically advanced i-VTEC mechanism is currently utilized in more than half of Honda's vehicle line up. The i-VTEC feature is equipped with two camshaft lobes, switching them at a certain rpm range commonly known as VTEC. This new series of honda engine is taken further with the intake cam being able to advance continually. The continuous variable camshaft phasing is determined by the engine load and the rpm range. At last, the world's first electronic i-VTEC controller had been developed by Power Enterprise. They are well known for developing the first ever electronic VVTi controller for Toyotas, called the Camcon CC-101. "The CC-101 unit can be made to work on VTEC engines, but not the i-VTEC. We developed this new controller because of that." States Mr.Goto of Power Enterprise. The 'H' obviously stands for Honda and they had developed this product exclusively for the Honda cars. The basic mechanism of this new unit is no different from the CC-101 unit. It enables the adjustment from 2000 to 9000 rpms in 500 rpm increments, with 20 degrees of valve timing advancement and retardation. It can also control the VTEC engagement point in 100 rpm increments. Like the CC-101, it also comes with a feature that can regulate fuel from minus 10% to plus 20% in 500 rpm intervals. For those enthusiasts who really desire this product but are weary of the tuning aspect after the installation, Power Enterprise has it covered. You can find a set of values as a foundation of tuning to suit your needs. Give each setting a try and see which one feels the best! The unit dimensions are 88 mm x 24.2 mm x 84mm, a 1/4 DIN size. The design of the box is very simple, and matches any Honda interior very well. The Camcon H requires 7 wires from the stock ECU for full operation. The ECU pinouts are all listed in the instruction manual so the installation can be a simple afternoon DIY project. The photo displays a setting of 5 degree valve timing advancement from stock. Plus or negative 20 degrees of change can be achieved, but the values should be set carefully. Another good thing about this unit is that it can be turned off anytime, to return to the stock settings on any vehicle. Moreover, plus or negative 10 degrees of settings either way will not hurt the engine in any major way. By holding down the power button approximately one second in the i-VTEC setting mode, the fuel setting mode can be accessed. The photo shows 2500 rpms (the 2 lower left lights means 500 rpms) at 3% of fuel setting. If set just right accordingly to the valve timing, lots of power can be achieved. Next to the fuel setting mode is the feature which enables the setting of the VTEC engagement point. Once again, this mode can be accessed by pressing the power button down for one second when in the fuel setting mode. The VTEC can be set to switch over from the low camshaft to high in any rpm range. This feature is also available in the Camcon CC-101 unit as well. The Camcon H is way different than its predecessor!! 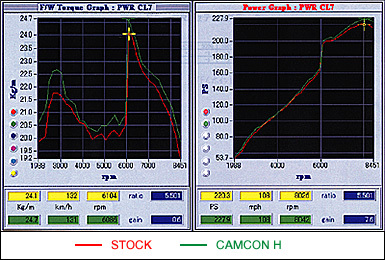 Displayed here is the data after the Camcon H was installed on a stock Euro R (CL7), and tuned at the stock VTEC engagement point. Stock base horsepower was rated at 220.3 hp @ 174 ft/lbs of torque, and after the Camcon H was installed it pulled 227.9 hp @ 178 ft/lbs of torque. Mr. Goto claims that more power can be achieved after the removal of the stock air filter. The Camcon H is proven to produce results! The values entered into the Camcon H for this test was all from the Power Enterprise website. This is a highly recommended product for the CL7 owners!